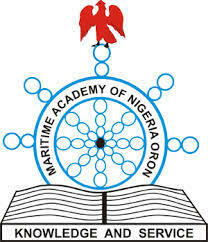 Maritime Academy of Nigeria (MAN), Oron, invites all the candidates who selected Academy as their institution of First Choice and have scored the specified cut-off marks to attend the Post JAMB UTME screening exercise for National Diploma programmes as stated below. 2. A minimum of 160 marks in the 2018/2019 JAMB Examination for Maritime Transport and Business Studies. 3. A minimum of five (5) credit passes in Senior School Certificate Examination or its equivalent obtained in not more than two sittings within the last five years in relevant subjects as detailed below. any two relevant subjects from Geography, Chemistry or other Science subjects obtained at NOT MORE THAN TWO SITTINGS. any two relevant subjects from Technical Drawing, Chemistry and other Science subjects. any two relevant subjects from Chemistry, Technical Drawing and other Science subjects. and any two relevant subjects from Government, Principles of Account, Commerce, and Geography. Medical test will be conducted on candidates to determine their suitability or otherwise. Applicants who must be single shall remain single throughout the duration of the programme. Applicants for admission into National Diploma programme in Nautical Science and Marine Engineering must be between the ages of 16 and 21years old as at the time of commencement of the programme while candidates applying for Maritime Transport and Business Studies and Electrical/Electronics Engineering must be between the ages of 16 and 25 years old as at the time of commencement of the programme. How to Apply for MAN Post UTME. Note: Application for admission can only be submitted online. Candidates who meet the cut-off mark and chose the Academy as their First Choiceshould log on using the JAMB Registration Number and the SCORE as their password. Please download and read carefully the requirements for admission and payment guidelines before commencing the registration. Deadline for Receipt of Applications: 20th August, 2018.